What is a Mission Central H U B? Mission Central, located in the Harrisburg area of Pennsylvania, serves as a collection and distribution site for the many health kits, cleaning buckets, school kits, and other supplies donated by United Methodist congregations as part of disaster response and development ministries, both domestic and international. It is one of five collection sites throughout the country. 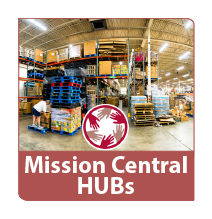 A HUB is a smaller version of Mission Central and it is directed and managed by local churches feeling called to expand their outreach ministries. A HUB can be a storage space in a church or garage, a building no longer being used for other ministry, a barn or any facility that could serve such purposes. HUBs may also serve as training sites for ERTs, Disaster Emotional and Spiritual Care teams, Connecting Neighbors, or house a Conference Disaster Response trailer and other disaster-response supplies. Each HUB is encouraged to determine the scope of its individual ministry, based on the facility space they have, the number of volunteers available, and the interests and service focus that is most important to that HUB location. Most HUBs collect and assemble UMCOR Kits that are used for response to disaster and in support of mission work, locally, nationally and internationally. HUBs learn what is happening locally in their area and seek to find out how they can help fulfill basic human needs…many times in support of other ministries and outreach projects in their area. Every HUB shares the common value of fellowship, service to God and service to others as their primary focus. How God calls each location to fulfill this focus is an exciting part of being a HUB. God may be calling your church to do even more for your community and in ministry to the world by becoming a HUB. It is the hope of the New York Conference to have an established HUB in each district. For more information on becoming a HUB contact contact Tom Vencuss at tvencuss@nyac.com or visit the Mission Central web site.